By using carpet underlay your floor will be too bouncy, and not using underlay at all will likely damage your flooring over time. money, either by using carpet underlay (big mistake), not using underlay at all, or laying the laminate flooring over older flooring (I have seen both carpet & laminate cases). What is the purpose of underlay? Underlay offers four core layers of protection but also ensures your floor feels like a real hardwood, slate, or tiled floor. By using carpet underlay your floor will be too bouncy, and not using underlay at all will likely damage your flooring over time. Reducing the sound of footsteps and echoing, which will make your room a quieter place to be. Adding a cushioning water resistant layer preventing excess moisture and ensuring your floor doesn’t warp over time (like a shock absorber). Insulating your room and ensuring heat doesn’t escape through the subfloor saving you money on your energy bills. Hiding small imperfections in the sub-floor. Which underlay should I buy for laminate flooring? Selecting the correct underlay for your laminate flooring is really just a case of looking at your subfloor. The two most common subfloors are wood and cement. We have however added a section for choosing underlay that is to be placed over a leveled floor (either hardwood or plywood). Before selecting an underlay for wooden floors it is important to ensure that your floor is level with only minor imperfections. If you feel that your flooring is uneven in places, or that your floorboards squeak when walked across you will probably want to consider some type of remedy before laying your flooring. Here’s an article on fixing an uneven wooden floor for laying laminate. If your wooden subfloor is relatively even you should be looking for a laminate flooring underlay that is approximately 3mm thick, or if using fibreboard (or foam board) 5mm. I have provided some personal recommendations below to save you time. The problem with underlays is that there are no standardizations amongst manufacturers, each product has a catchy name that tells you little about the actual product, and this just adds to the confusion when trying to select the right product. I was luckily introduced to foamboard (a fibreboard alternative) on the second laminate flooring project I ever completed and it is what I have used ever since when laying flooring on either a wood or chipboard subfloor. Foamboard is thick enough to iron out any small discrepancies, imperfections, and bumps in the subfloor. This underlay also has the extra benefit of raising the floor to that of a similar height as carpet, reducing any height discrepancies when laying laminate in a room that is to be joined to a carpet in an adjoining room. 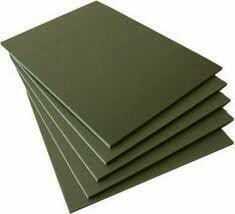 Foamboard is easy to cut and provides just the right amount of underfoot give. It also provides a good amount of sound insulation and dampening. 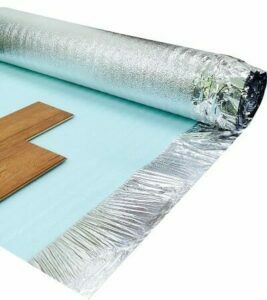 Our underlay installation guide for wood subfloors assumes you are using foamboard simply because it is our number one underlay recommendation for both loft conversions and any other rooms with wooden floors. This underlay is NOT suitable for flooring with underfloor heating. We will cover this in an alternative guide. I have used 5mm foam board on my last three laminate flooring projects and I have never been happier. Easy to install, easy to cut, and creates a great surface for your laminate flooring. When laying an underlay on a concrete subfloor it is imperative that you use a damp proof membrane (DPM) which is a material applied to prevent moisture transmission. Concrete is a porous material that can allow water to seep up into it and through to your flooring. All joints should also be sealed with a vapor barrier tape to ensure your laminate flooring does not retain moisture and begin to expand or cause molds and mildew to develop. If laminate expands it will cause your flooring to buckle, requiring you to lay the floor again using the proper underlay. It is possible to lay both the damp proof membrane (DPM) and underlay separately, however, this doubles your workload, and actually works out more expensive (go figure). I have always used a combined damp proof membrane and underlay which ensures you only have to cut and lay once. Although this underlay will iron out small imperfections, you should first ensure that your subfloor is relatively level. If it is not level please read my article – leveling out a concrete floor using a self-leveling latex compound. My personal recommendation for combined DPM and underlay is as below. Our guide on laying underlay on a concrete subfloor will assume this is the underlay you have chosen, though there should only be small differences if you have opted for an alternative underlay or combination of DPM and underlay. When a floor has been found to be uneven, often the floor is leveled with the use of either hardwood (for minor issues), or plywood (for more major issues). It is my opinion that the underlay used in such instances should be selected carefully. The main consideration here is that the floor will already have gained some height (especially if the thicker plywood has been used). So adding even more height, which would be the case if using foam board may not be the best way to proceed. In this instance, I would suggest using a 3mm underlay, unless of course height is not an issue then continue with the 5mm foam boards as recommended above. We have provided you with the information you need to select the correct underlay for your project. The products we have recommended above are simply that, just recommendations. The truth is that there are hundreds of products that are probably suitable for your laminate flooring project, however when I find a product that works well I tend to stick to it rather than chop and change on a project to project basis. If you believe another product other than the ones recommended above will serve you better for your personal circumstances, by all means, give it a go, you may have very well discovered something that I am yet to. Let’s get ready to install your underlay and get on with the job. This checklist has been created to cover every aspect of your projects plan. 3. You'll have a quick link to our reference guides for each step.